By the example of the prophet Mohammed, the white Angoras were esteemed in the osmanic world and are honored as National cat since then . A legend tells, that Mohammed’s favorite cat Muezza is fast asleep on a coatcorner of the prophet, as he is called away. As he doesn’t want to disturb the rest of his favorite animal, he cuts up the coatcorner and quietly leaves the room , tenderly looking back. Another legend tells that Wishcats are supposed to exist. If someone has a strong wish, he should put such a cat on his lap and whisper his wish into the cat’s ear. Then he should give her plenty of tidbits, and if the kitty likes it, his wish will come true. But this only happens, if it is really a whishcat. No one knows that for sure, because it brings bad luck, if someone speaks out, that the cat made his wish come true. By Turkish people’s superstition Mustafa Kemal Atatürk, the founder of the Turkish Republic, shall be reborn one day in shape of a white Turkish Angora with one blue and one golden eye. That’s the reason, why cats with odd eyes are especially revered in Turkey. They are called Van Kedisi. No one is really sure where or how the Turkish Angora originated. Often recounted is the theory that the Angora developed from the longhaired Pallas cat (Felis manul), an Asian wildcat about the size of the domestic, but this is doubtful. The Pallas has fundamental differences from the domestic feline and, unlike today¿s affectionate Angoras, is virtually untamable. It is likely that the Turkish Angora developed from the African wildcat, like all other domestic cats. Possibly some crossbreeding occurred between the two. English writer E.V. Lucas once said that any cat is really the most beautiful woman in the room. The Turkish Angora confirms it. This ancient breed is one of the world’s most beautiful purebreds. Her fine silky fur, long elegant body, upright pointed ears and large brilliant eyes make the Angora highly prized for her beauty and grace. Once thought to be extinct, the Angora has made a recent comeback. While still rare (24th out of 37 breeds, according to the Cat Fanciers Association’s 1999 registration totals), the breed is gaining new fans every year. Longhaired white cats have been noted in Turkey and surroundin g areas for centuries. According to legend, Muhammad, founder of the Islamic faith, possessed a Turkish Angora whom he treasured. Rather than disturb the cat as she slept on his robe, he cut off the sleeve. If true, the Angora has been around for more than 1,400 years. The Turkish Angora cat is a semi-longhaired cat that originated in Turkey. 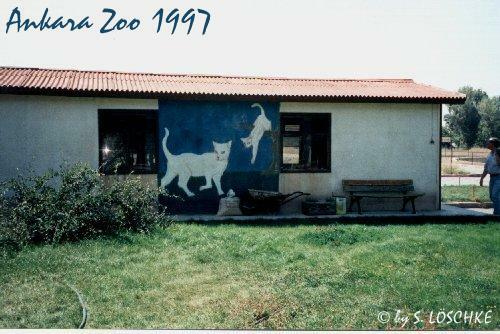 Cats from a breeding program in the Ankara Zoo were brought back to the United States in 1962, kindling interest in this ancient breed. Turkish Angoras are long-bodied and graceful with a fine, silky coat. Although white is the most well-known color, Turkish Angora kittens come in a variety of additional colors and patterns. The Turkish Angora personality is intelligent and quick-witted, as well as active and agile. «Turkeys» can be very opinionated and stubborn; it is difficult to change their minds once they have formed an idea. Those who live with them claim that Turkish Angora cats are one of the only breeds with a well-developed sense of humor. They need active play and can become bored if left alone for long periods of time. Turkish Angoras are not large cats, averaging between 5 and 9 pounds. Like almost all other breeds, of cat, females tend to be smaller than males. Some Turkish Angora breeders import cats from Turkey, where they are still highly prized. Such new blood is an important source of outcrosses for this remarkable and beautiful breed. A Turkish Angora breeder advertising «imported lines» usually means they are using foundation stock from Turkey. Associations: The Turkish Angora breed is accepted by most major cat registries. In GCCF, the breed «Angora» is not a Turkish Angora, but is more similar to the breed known as Oriental Longhair in the United States. Стандарт CFA в оригинале, с перечнем допустимых окрасов и указанием номеров цветовых классов CFA. Далее приводятся ссылки на статьи, размещенных на других сайтах. Они будут открываться в новом окне.